Bell Ringers for STAAR Prep! Great review for 3 weeks, for instance the last 3! 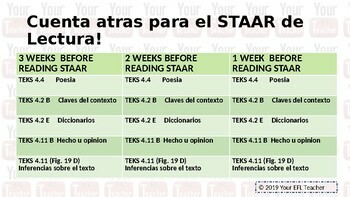 Spanish STAAR Released questions with text directly from the passage, ready to be used as a Bell Ringer! 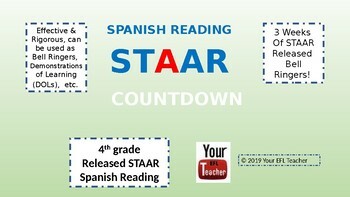 Highly rigorous test prep: directly from STAAR Released Tests. UPDATE: This product is now in Powerpoint Version. If you save it on Google Drive, please open it with Google Slides to make the most of it.